Dividend cover is a useful measure to see whether high dividend yields on a stock are too good to be true. It helps you determine if the dividend of the company you are researching is sustainable in future quarters. There is little point buying a 10% yield dividend stock if that dividend disappears as soon as you've bought it! 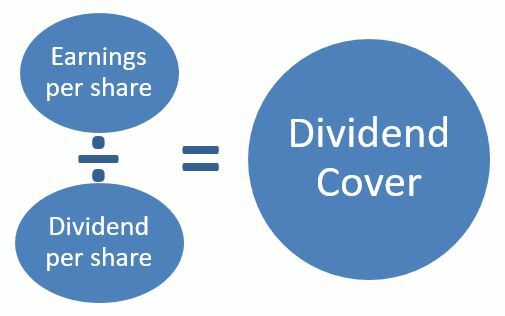 The dividend cover shows you how many times over your dividend is "covered" by the earnings. For example if ABC Plc is earning $4 per share and paying an annual dividend of $2 per share, then the dividend cover is 2 (4/2). Generally, we'd view a dividend cover of 2 or more as a safe dividend. Once it falls below 1.5 then the dividend could be under threat. In the 2016 fiscal year, the Earnings Per Share (EPS) of Apple Inc was $8.31 and the Dividend Per Share (DPS) was $2.23. Apple's 2016 dividend cover is (8.31/2.23) = 3.73. This looks pretty safe to us! In the 2016 fiscal year, the EPS of Johnson and Johnson (JNJ) was $5.48 and the DPS was $2.95. This gives a cover of 1.86. This doesn't look as safe as Apple and is below our ideal level of 2, but there are a few things going in JNJ's favor that make the dividend look quite safe on further analysis. Firstly, JNJ is a dividend aristocrat having increased its dividend for 53 straight years (it's actually a dividend king - a title reserved for stock with 50 straight years or more of dividend growth). Management would be extremely reluctant to break that incredible record. Secondly, JNJ has a very strong balance sheet. They are one of only two corporates to be rated AAA by at least two agencies (Microsoft is the other one). As of the fiscal year end 2016, JNJ had around $14bln of cash on the balance sheet and relatively small net debt (net debt is the "short term debt" PLUS "long term debt" MINUS "cash"). Having such a strong balance sheet helps to make the dividend more secure and gives more flexibility for the business. Finally, dividends are paid out of cash not earnings! JNJ has been a consistent cash-flow generator for a long time which has allowed it to maintain and increase its dividend for many years. In 2016, JNJ generated over $19bn from its operations, yet the dividend only cost them $8bn. They also repurchased $4bn of shares. This highlights a lot of headroom from JNJ's cash-flow statement. It's no surprise that some companies have far more stable earnings than others. Defensive companies such as consumer goods companies or drug companies tend to show more stable earnings than cyclical companies such as commodity producers, house builders, or financial companies. To counteract this cyclicality, we think you are best looking at the cyclically adjusted price earnings ratio (CAPE) and taking an average through the good and bad times. A study of the company's dividend history can also help you for clues. Earnings can be subject to "one offs" which could be positive or negative, but are unlikely to be repeated. Examples of these "one off" earnings events could include the sale of a subsidiary above the balance sheet "carrying value", the sale of a property, a tax settlement, a restructuring, or an impairment of a subsidiary. Sometimes there are non-cash adjustments (such as an impairment/write down) which technically should not reduce the ability of the company to pay the dividend. But don't fall into the trap of thinking that these are less painful, just because they are a non-cash charge. These impairments still indicate mistakes from previous years and are very real charges! Management will often strip out these "one off" events and label the underlying earnings as "adjusted earnings", or "core earnings". Your job is to make sure these really are one offs and management are not using these labels as an opportunity to bury further bad news. Some managements (who will remain nameless!) have a nasty habit of having "one off adjustments" very frequently. This is a further warning sign to us. Warren Buffett actually recently talked about this topic in his 2016 year end letter to shareholders. You can find his letter here. Remember that as an equity holder, you are at the bottom of the capital structure. The company must pay its interest on debt before they pay you. A company with a lot of debt can become a "slave" to that debt and their options will be more limited in terms of rewarding their shareholders. This is especially true if there is a downturn in business or they are unable to refinance their debt. A company with no debt (or very little) and lots of cash on their balance sheet have far more ability to keep their dividends going even if there is a temporary dip in earnings. Always check to see how much debt the company has before determining whether you think the dividend is safe. As you can see, the dividend cover is a very useful way of quickly determining if the current dividend is sustainable. You do, however, need to dig deeper to avoid any nasty surprises. Of course, a dividend is never 100% safe as bad (and unpredictable) things can happen to any company. All you can do, though, is to try and put the odds in your favor as much as possible and have adequate diversification. Looking for more information on dividend cover? Then try here.